Maybe you’ve just got yourself a Nintendo Switch, or maybe you’ve had one for a while. Either way, if you’ve spent the cash on one, you’re going to want to keep it safe. The best way to do this is by getting yourself a cheap screen protector which can ensure that the screen doesn’t get damaged. There are a ton of different deals for Switch screen protectors online, and they’re usually quite cheap. But does one deal stand out for the rest as a complete bargain? Well, here are a few of the best deals that I’ve been able to find online when I’ve been looking. 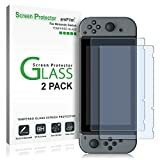 This is the best deal that I can currently find online for Nintendo Switch screen protectors. For a cheap price, you get a 3 pack of protectors instead of the typical two, which makes it pretty great value in my opinion. Screen protectors in general are very similar if not exactly the same, so we’re really just looking for the best deal possible. Like any good screen protector, this model has 99.9% transparency. This means that you can easily see through the film without it causing any sort of tint to the screen, which can be an issue with poor quality options. It’s very thin too, which helps to reduce glare, but is also thick enough to protect it against scratches. This pack comes with some wipes to keep the screen protector clean, as well as a micro fiber cleaning cloth too. Of all the deals that are available online, this is the top one in my opinion. This 2 pack of Switch screen protectors is one of the best sellers available online. One of the main reasons that they’re so popular is that it’s really easy to apply this to the front of your Switch, so it’s definitely worth getting one if you haven’t already. There isn’t much of a difference between this set and the previous 3 pack, except that you only get two in this set (though they’re pretty much the same set, so the iVolver pack are better value). But, if you find the other set sold out, then this might prove to be a valuable alternative. There are a few things to consider when you’re looking for a good Switch screen protector. Of course, it’s needs to be transparent enough that you can easily see the screen. Usually, you’ll also want the screen protector to be very thin as well, as this can allow you to easily through the protector. Fortunately, these screen protectors have both of those things, which is why it’s one of my favorite options available. Blue Deluxe Case - Light and Durable Protective Hard Shell and Soft internal material to keep your Switch free from scratches. A HOOk&LOOP Secures Design (We have replaced two elastic straps with a Tab which is easier to put in and take out the Switch with a Tab ) , Designed to make your switch more stable and convenient when you're traveling or not using. LARGE STORAGE - A large zippered mesh pocket provides secure storage room for some small Nintendo accessories like charging cable, slim power bank, ear buds, and 2 extra Joy-Cons, Easier to Close and Easier to Carry. It also build with 20 game card slots, allowing you to carry and change your favorite games anytime & anywhere. 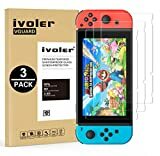 If you’re looking for a Switch screen protector as well as a case, then this might be a good choice for you. The case itself is pretty well made, especially considering this duo is the same price as many screen protectors on their own. Nintendo cases can be expensive, but they’re definitely worth getting if you’re going to use it a lot (although I usually use mine with the TV, it’s good to have a case for when I’m using it on the road). The good thing about the case is that it has a small toggle inside, which enables you to easily lift the switch out of the case without damaging it. It also comes with a ton of game slots (20! ), so you can easily keep your games with you as well. As for the screen protector itself – well, there isn’t much difference between this one and the others available! As long as they have 99.9% transparency and are bubble free, that’s all we can really ask for! So, this is a good combo deal if you want a screen protector and case. If you’ve just bought a Switch and are thinking about what other accessories you might need to pick up, then I’ll mention some of the things that I picked up when I first got my Switch too. Of course, a screen protector is probably the first thing you should get if you’re going to be using your Switch on the go a lot, but there are other things you’ll want to pick up as well. The first thing that I bought with my Switch was an extra set of controllers. Yep, they’re pretty expensive, which isn’t ideal for those that want to keep things as cheap as possible. But, once you’ve bought them you’ll never have to purchase them again, so it was worth picking them up early in my opinion. For the Switch, 4-way is so much fun with a lot of games like Super Smash Bros and of course, Mario Kart. There are some Pro controllers as well, which give you more options than you’ll get with a standard controller, and the majority of people think they’re a better choice. A Pro controller has a better battery life and will give you more control in your gaming. 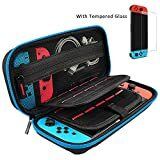 If you’re going to be using your Switch portably in any capacity, then as well as a screen protector you’re going to want a hard case shell. This can help you to ensure that you’re not going to cause your Switch any lost lasting damage when you’re transporting it around in your bag or rucksack. You can usually pick up cheap hard shell cases on Wish or eBay that do a good enough job. If you’re charging your Switch on the go, then you’ll need to pick up a USB-C cable to do this. You can still charge it at home, but if you’re someone who’s going to be playing a lot when you’re on the go, then a USB-C cable is another essential you’ll need to have. You can also look at picking up a charging stand too if you want to keep your Switch charged whilst you’re on the go. It’s also worth picking up some cheap headphones to use with your Switch. At home, I use a cheap set of gaming headphones, but when I’m out I just connect the Switch to my wireless headphones – to do this, you also need a Bluetooth transmitter. Part of gaming is immersing yourself in the gameplay, and a headset can be an awesome way to do that. Overall, these are just a few of the best Nintendo Switch screen protectors that you’ll be able to find online. There are undoubtedly other options available, as they’re all very similar in the way that they are made. Usually, one screen protector should be enough to last you a long while, but if you get a multipack then you can replace the protector after a year or so, after the protector has done it’s job. A screen protector is always a wise investment for a Switch, as it can prevent any tears and help retain the value of your Switch (one scratch can devalue it significantly!). The Switch is my favorite Nintendo console in recent years, so if you haven’t got one then it’s definitely worth considering picking one up. It could make a massive difference to your gaming regime – I spend most of my time nowadays on my Switch as opposed to other consoles!